Lala lalalala lalalalala. I grew up watching Smurfs. I was 5 or 6 year old then. Smurfs are back and in 3D in the cinema. This time the gang in blue will ventured out from their world and goes to Big Apple (New York if you are not familiar with the nickname of US cities :p). Actually The Smurfs got lost in New York and are trying to find their way back to Smurf Village. 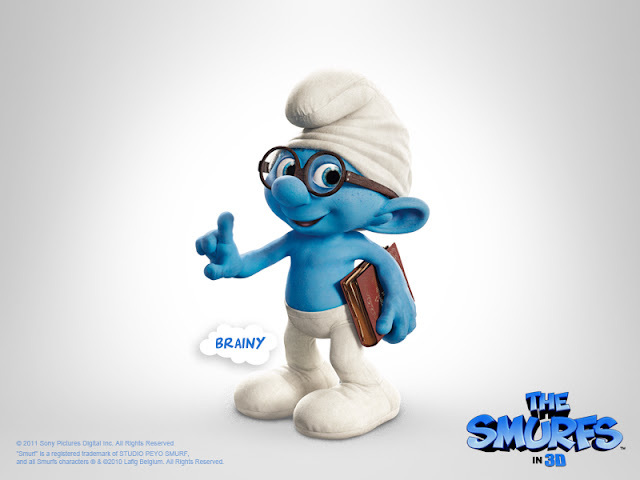 My favourite Smurf is Brainy Smurf. Of course, Brainy Smurf will come up with his so call plan which the other smurfs won't listen to. The only plan they will follow is Papa Smurf's plan. He asked Gutsy Smurf to find a map with the help of Brainy. Smurfete will then interpret the map because she's actually beauty with a brain. Of course, Clumsy will accidentally destroy the map. Fear not, Brainy tells the others. "I've just learn that we can get a map from this piece of hardware." It's a GPS device. From his long research of the world map, Brainy remembers the coordinates of Smurf Village. He entered it to the GPS Navigation device and off the go. Of course, it is not smooth and easy during their journey back home but in the end, they made it safely back to Smurf Village. Alright, The Smurfs will be showing in Malaysia cinemas on 1st September. In the past, I only see Smurfs in 2D but now I can see how they'll be like in 3D. Come on all you 80s' babies out there, it's time to relive your childhood. Lala lalalala lalalalala.